Six Days in Tokyo, Episode 4: Wrapping it Up | .solitary agent. Nearly six months have passed since I took the trip I’m still writing about here, and since I have another couple of trips coming up soon, I think it makes sense to go ahead and finish talking about Tokyo! My upcoming stay in the UK will last almost a month, so I’ll try and be more proactive about updating DURING my trip as opposed to writing about it afterwards. My second full day in Tokyo was spent mostly in the neighborhood of Nakano. To get there, I took the Oedo train line, which was smaller and more local-oriented than the Yamanote line I’d travelled on previously, which only stops in some of the most tourist and/or business oriented destinations. One notable difference was that many advertisement posters on the Yamanote line trains were at least partially in English, while on the Oedo line they were entirely in Japanese. Many of the passengers were clearly commuting to work or school. There were considerably less shopping bags to clog up the aisles. The trains were also less crowded. Despite feeling a bit more “alien” in this environment, I enjoyed the more laid-back atmosphere and felt a bit more like I was catching a glimpse of the “real” Tokyo and people that lived there, rather than the glossy facade the busiest parts of the city shows to those who are just passing through. One of the few non-shopping-related social interactions I had in Japan occurred on that train ride. I was seated, and there was a vacant space next to me. A group of three young schoolgirls came onto the train, in uniform and loaded down with backpacks and books. They were probably about ten or eleven. One of them flopped down in the seat next to me, but the other two remained standing – there wasn’t anyplace in the car that all three of them would fit into. My stop was coming up soon, so I decided to get up and offer my seat (by way of standing up and gesturing towards it.) They started to protest, but I’d read in my guidebook that most Japanese will always refuse favours or gifts at least once to be polite, and that you’d have to insist. So I then gestured again and said “Dozo.” (“Please.”) All three girls thanked me and flopped into the seats in unison, giggling. I had noticed some middle-aged passengers eyeing me curiously when I first stood up, but when I smiled at the kids they smiled as well, in that indulgent sort of way that older people often smile at youth. It was nice. The television could have fit in there. Speaking of three-piece suits and briefcases – on my way back to the hotel, it was evidently around the time salarymen leave work. 80% or more of the men on the trains were in business attire, almost invariably black or dark grey suits. Even their ties are usually quite sober, plain or simply striped. Sure, I saw the occasional guy with spiky rock-star hair, pierced ears and platform shoes, but they were definitely in the minority. On my third day, I went in search of book stores – specifically the amusingly named Book•Off. Friends of mine who had recently visited Japan had raved about the deals they found there on art books, games and anime. They sell all of those things secondhand, as well as music CDs. Unlike similar stores in the US, most items are in near-mint condition, with the original packaging. My friends had visited several cities on their trip and found a Book•Off at most of their stops. I just looked for the one closest to my hotel, and found one in the vicinity of Shinjuku station. Finding it was rather difficult, because there was construction going on and my highly specific directions were thrown off since pedestrian street traffic needed to be re-routed. The shop was also smaller than I expected, not highly visible from the street. I picked up a few things there, then walked back to a large shopping center connected to the station, where I’d seen a sign for Books Kinokuniya, probably the best-known Japanese bookstore chain (There’s even one in NYC.) 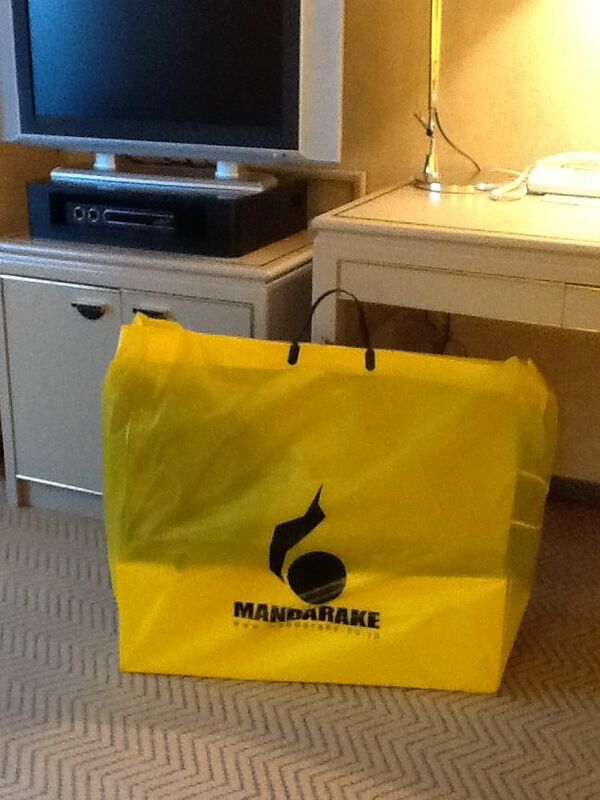 I went through a basement level of a large department store to get there, which was overwhelming and impressive. Most department store basements in Tokyo are dedicated to food, both prepared and fresh. Much of it is beautifully packaged. The crowds were a little too much for me, so I didn’t browse much, just walked through. The bookstore was massive, with eight levels connected by narrow escalators and a single elevator. The space itself was not very large on each level, but the shelves were very close together, high and packed full. The variety of magazines devoted to anime, manga and gaming were staggering. I found TWO monthly magazines devoted entirely to the highly specific genre of otome games (dating sims for girls in which the female player character interacts with a cast of very pretty young men.) Most of the magazines come in sealed bags with bonus items – anything from figures to clear file folders to posters. 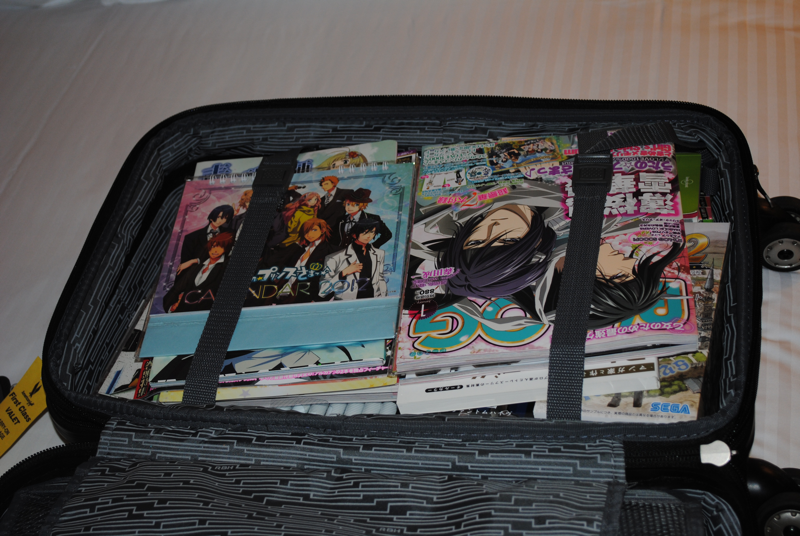 It’s a suitcase full of bishonen – what else would I bring home? The next day was my last full day in Japan, and I decided I wanted to go back to Akihabara again. I picked up a PC game a friend had given me money for, and picked out a couple of discounted ones for myself (I may be able to find English translations/walkthroughs for them until my Japanese improves.) I also made it a point to eat in restaurants instead of just grabbing things at convenience stores that day. For lunch I stopped in the Daiichi Seimei business complex across the street from my hotel – a huge skyscraper full of business people during the day and largely empty at night, although there was a 7/11 and a post office on the basement floor, along with some restaurants. I’d noticed an Italian restaurant on a previous walk-through and decided to try it. I had some very good pasta with a tomato sauce and a dollop of creamy cheese which I mixed in. It was an inexpensive, casual place but the food was very tasty. In the evening, after returning from Akihabara, I chose a Tonkatsu place in the same building. Tonkatsu is a boneless pork fillet, breaded and deep-fried, served with a savory-sweet sauce and, in this case, with a mound of raw shredded cabbage topped with citrusy ponzu dressing. It was delicious. I was also served a bowl of miso soup and a small pot of green tea. I don’t normally care much for miso soup at home, but whether it was the fatigue and chilliness of the winter day or superior ingredients, I enjoyed that bowl greatly. When I’d drunk up most of it, I noticed tiny snail shells in the bottom of the bowl! I wasn’t expecting that. I don’t THINK I was meant to extract the snails from their shells (they were really small, about a centimeter in diameter) so I just left them there. 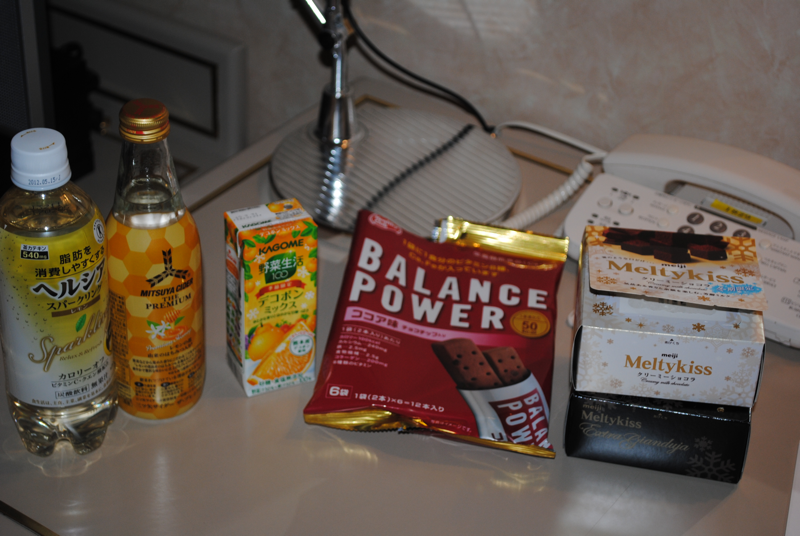 I also filled up on drinks from the convenience store that night, because Japanese soft drinks are amazing. I also stocked up on Meltykiss, which is the most wonderful chocolate in the world. I was reluctant to leave the next day, having finally gotten used to the train system and all the walking, but I couldn’t ignore my plane ticket. I also couldn’t let myself spend much more money. So it was time to go home. In contrast to the plane ride TO Japan, on the plane ride back I didn’t get up to go to the restroom a single time. That probably wasn’t healthy. There were a lot more entertainment choices, including many Japanese films with the option of English subtitles. First I watched ‘My S.O. Has Depression,’ (S.O. stands for “significant other”) which was a charming, sometimes quite funny look at how depression can affect a relationship. The protagonist, a manga artist (whose autobiographical comic was the inspiration for the film) is often disappointed, confused or even infuriated by her boyfriend’s ups and downs, at the same time struggling to keep motivated in her own career. The portrayal of depression was more subtle and nuanced than what’s frequently seen in western films, and the young couple’s eventual acceptance of the situation and resolve to make the best of it was truly touching. The next movie I chose was called “In His Chart” and was about a young doctor who chooses to stay and help patients in his own small rural community, even though he’s been offered a position with a large teaching hospital where he could work on perfecting techniques that might eventually lead to saving more lives than he could ever hope to touch as a small-time rural physician. I really enjoyed both films and found myself sniffling a bit during both of them, which was mildly embarrassing, but I don’t think anyone noticed. Landing in Chicago was a bit of a culture shock, even though I’d only been away a week. Suddenly, people were loud and assertive and often downright rude. Instead of patiently and quietly waiting in line, they huffed and theatrically checked their watches as if that would make the document-checking go faster. I found myself bowing and starting to say “sumimasen” to someone who almost ran into me as I exited a restroom. I was grateful when my final flight was over and I could get into my car, away from noisy, mundane conversations in a language I could unfortunately understand perfectly.